INDUSTRY.co.id - Jakarta - President Joko Widodo revealed the results of the US News & World Report survey put Indonesia ranked second in the world's most attractive countries for investment. "Two weeks ago, US News & World Report Magazine in the United States conducted an international survey of which countries are the most interesting, not the best, the most interesting." Indonesia is ranked two in the world, "said the President as he spoke before the leaders of commercial banks Indonesia gathered at the State Palace of Jakarta, Thursday (16/3/20180). 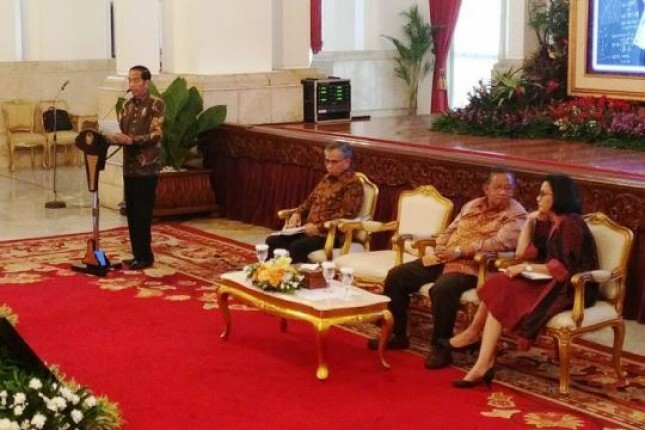 Jokowi said the survey method conducted by the magazine from the US is interviewing 21,000 respondents to rank and selected 6,000 respondents’ executive decision makers. "One thing I learned, it turns out that investors make investment decisions in a country, not the condition of the country, but because of the trend of the country," he said. Head of State explains that the more attractive investment in a sought country precisely conditions are not ideal but the trend is improving. "Because they know the country is going to fix things that are not ideal yet, that are what it sees, that's what it is, try to compare the ideal country but the downward trend, for what," he said. The President believes Indonesia will be more trusted by international investors because of the improving trend. "Perhaps improving slowly, but clearly consistent, that's what we see," said Head of State accompanied by Coordinating Minister for the Economy Darmin Nasution, Finance Minister Sri Mulyani and Chairman of the Board of Commissioners of Financial Services Authority (OJK) Wimboh Santoso when meeting with the leaders of commercial banks Indonesia. To that end, the President asked Coordinating Minister for the Economy Darmin Nasution continues to improve the ranking of ease of business in the country which in 2017 is still in the order of 72. "This year I believe fewer than 60, but can jump below 50. I remind you continue Coordinating Minister of Economy, I ask below 60, was whispered to me can be fewer than 50, if you have dared to whisper if not real," he said. The President also considered that the confidence of investing in Indonesia is also improving as seen from the Standard & Poor's Rating step that returns Indonesia to investment grade. "While the Fitch rating that has increased again from BBB- to BBB is an international belief to Indonesia," said Jokowi.